Since starting winter sown seed on Dec. 21st, I’ve planted new ones every few days. Jugs total 51 with more to come. 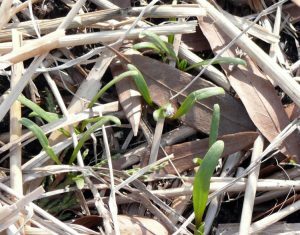 I figure with the mild winter we’re having, it’s a great opportunity to experiment with seed I may not have planted this way. Jugs have been planted, tapped closed, and tops removed for ventilation. I also label each jug on the outside with a marker and put tape over the writing so it won’t wear away. 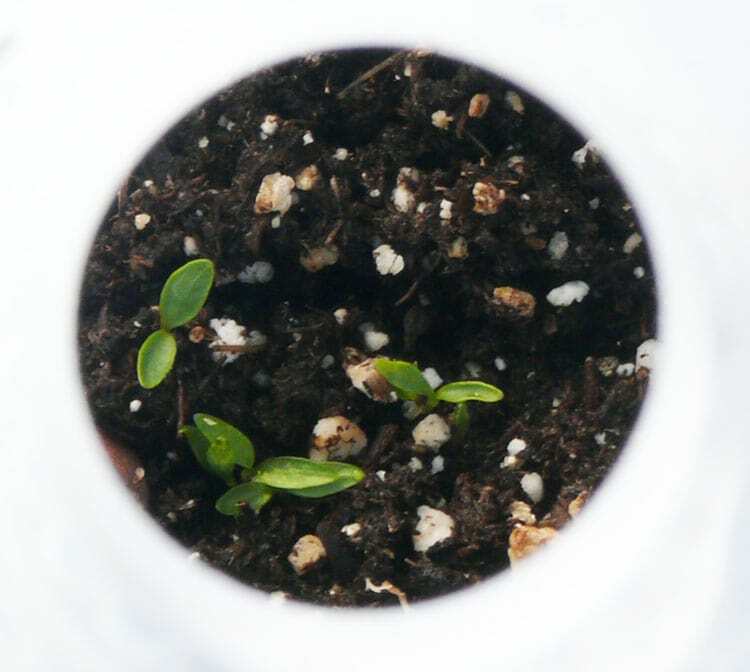 Seed planted between December 21 and January 6th have germinated. 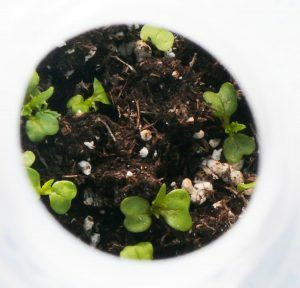 Included are different varieties of lettuce, mizuna, onions, rosemary, echinacea, snapdragons, claytonia, lavender, sweet william, beets, spinach, swiss chard, iberis, and parsley. All have been thawed and frozen many times, but are still looking good. It was hard to take pictures through the top of the jug, but you can see enough to give you an idea of what’s going on inside. This is a great way to start parsley. I’ve several jugs of parsley planted. 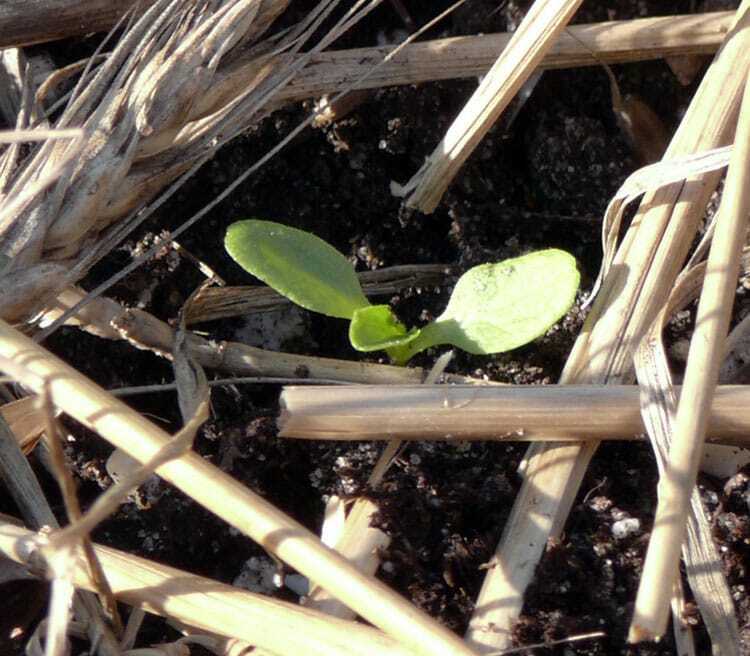 Even the German Giant Radishes sown January 29th have germinated. I’ve always direct seeded radishes, but just couldn’t resist starting a few radishes this way to see how they’ll do. The most exciting thing to date was having one of my favorite heirloom lettuces (that dates back to the 1740s), Green Deer Tongue, get about 3 times bigger than other varieties planted the same day. I transplanted in the garden not even a month after sowing the seed! If temperatures are expected to get below 29 degrees I’ll put one of my cold frames over them. Green Deer Tongue lettuce Winter Sown on January 6th — already transplanted to garden. I was surprised to see the lavender and rosemary come up so quickly. Lavender needs a time of chilling before germination takes place, so I guess my timing was good. Last fall I planted gobs of stuff. It would come up and then disappear — so I guess something was eating it. Very disappointing. Fortunately I had some Red Russian Kale, a dozen lettuce plants and patch of spinach make it through. 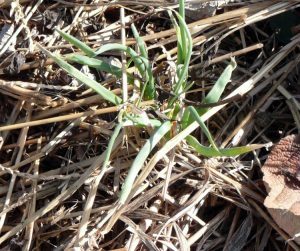 Part of a small patch of spinach in the garden about 3′ x 3′. Really sweet and delicious this time of year. I planted some more seed in the bare spots around the spinach and it’s germinated and doing fine thus far. Spinach sown in the garden in December, now coming up. 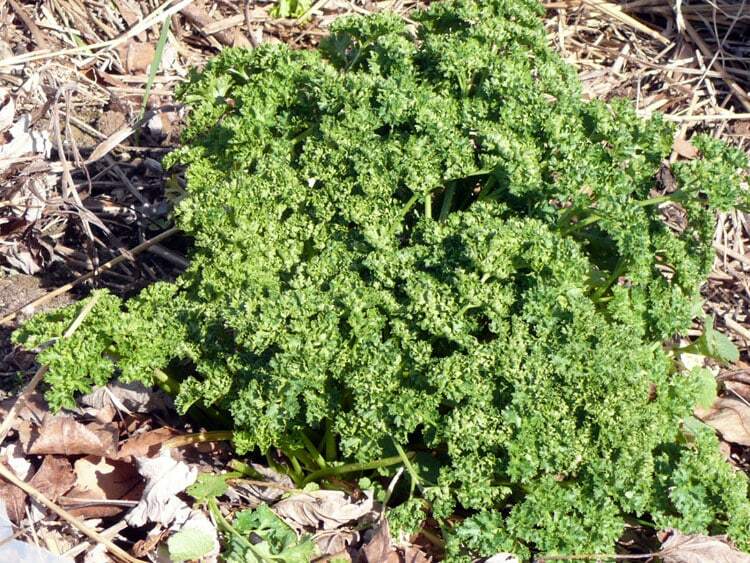 I had 3 parsley plants left in the garden in the fall. The one shown below was the biggest. I’ve been rationing — trying to make it last until the small seedlings start growing. As huge as this was it’s now only about a foot and a half square. These spring onions don’t look like much, but they’re DELICIOUS! I try to start the winter with at least 50 spring onions to get me through February and/or March. Spring onions in the garden in February. Planted last year. 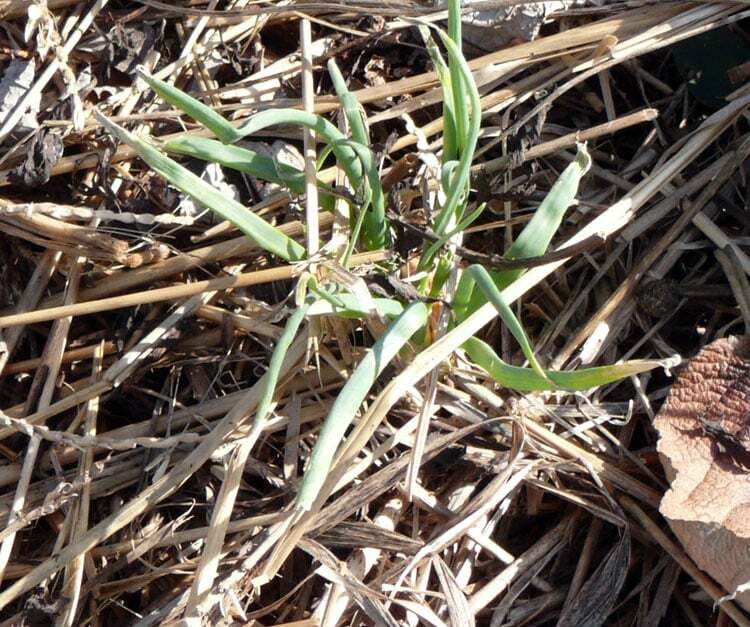 The multiplier onions I planted last fall are up about 4 inches. They’re great onions because when you finally get enough to save, they’ll last as long as you need them without going bad! A great backup onion. I couldn’t resist adding this picture of the small Illex tree making it’s winter show. Several bushes had to be removed from the spot in the lower right corner. Removing them dislodged the Illex. Bill has it staked to give it support. The male bush (not shown) is bigger and has perfect form and shape. In spite of its less than perfect shape, I don’t want to take this female out because I’d have to start all over. It’s so pretty with all the berries. Illex making its winter show in the back side border. I hope you’ve enjoyed taking a look at some of what’s growing for me and that you’re having great success with yours! Thanks for the pictures. 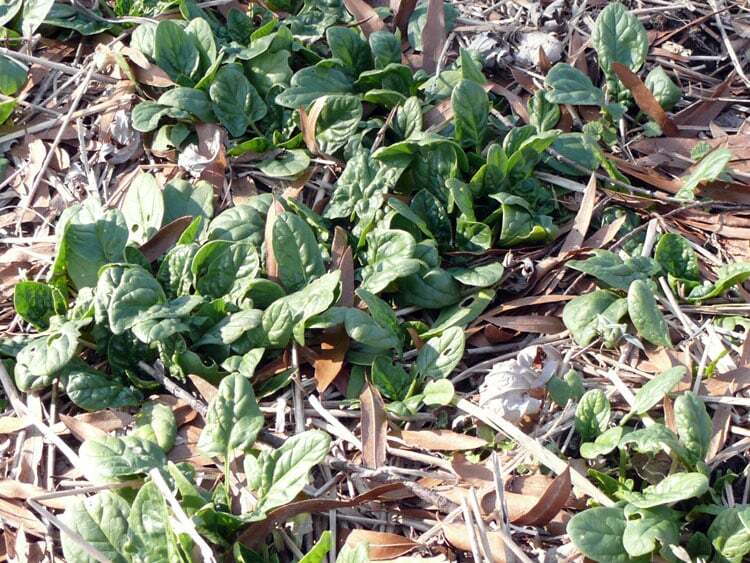 I love how sweet spinach is in the winter. I’ve got a nice patch of lettuce (on a protected side of a shop) which is feeding me this winter. We have barely had measurable snow this winter. I love seeing that stuff is growing for you already, very inspiring! Last year my beds didnt do well at all but Im optimistic about this year and ready to get some seed going! Woohoo! The winter has been delightful without severely cold temps and snow. I’ve really enjoyed it. Glad to hear you have a nice patch of lettuce feeding you this winter! 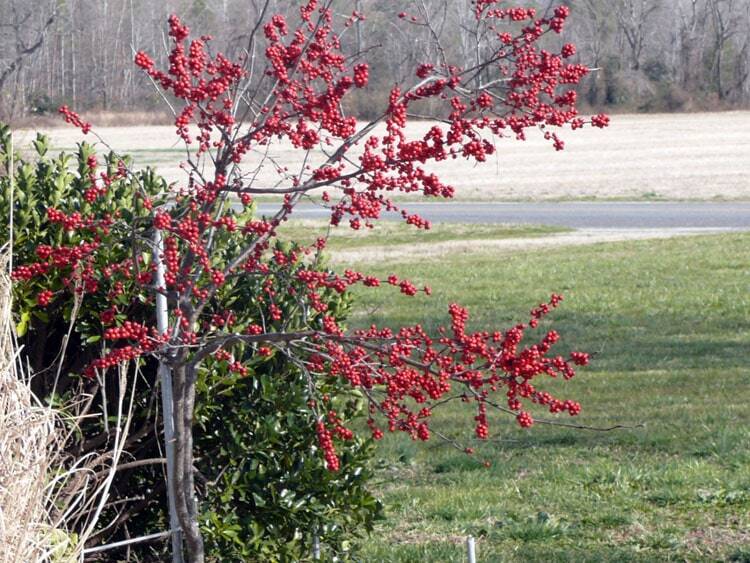 There’s nothing more enjoyable than being able to eat homegrown all year — even in the winter! Keep me updated. I always enjoy hearing from you! I’d like to hear more about your beds. 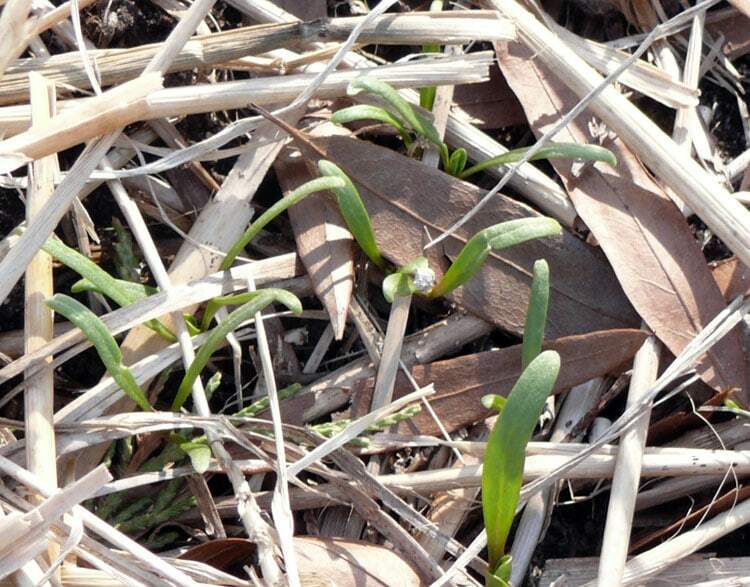 If you’ve added lots of organic material (for organic matter) to your garden beds — they should do fine. If you’d like to talk more about it feel free to email me at Theresa@tendingmygarden.com. Glad you’re optimistic about this year and getting ready to get that seed going! You are inspiring me! Everything looks wonderful. 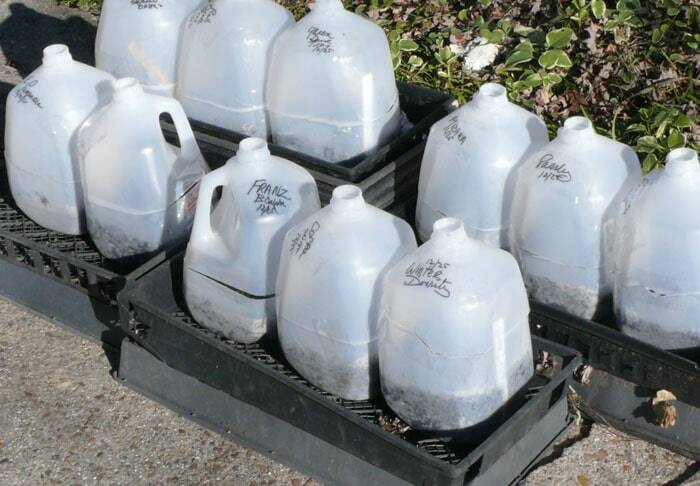 I have a set of jugs…not 50 something, but a few, and I keep procastinating on winter sowing…but thanks to you, I am going down to do some right now! Glad to hear it Gail! You’ll find it exciting I think. As of today, I have broccoli coming up! I planted as with all my wintersown things, but then brought it in the house to germinate. They’re just coming up this morning. I was so excited. I’ll move them outside tomorrow so they can get light.